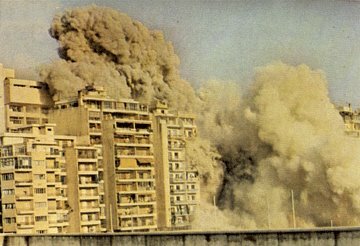 “War, however tragic, is often a source of architectural invention,” writes Farès el-Dahdah. [Image: From Wonder Beirut, 1997-2004, by Joana Hadjithomas and Khalil Joreige]. A new geography of investment soon followed; and, beyond the bombs, Beirut’s infrastructure was transformed. These internal erasures also affected the city’s natural coastline. The port of Beirut, for instance, served as a dumping ground for rubbish, as disposal of waste by other means was too dangerous. A moving coastline of garbage slowly infilled the sea. “Within the historic context of the evolving shoreline, Gustafson Porter has suggested a new line… revealing elements of the changing historical coastline and acting as a connective spine. On the ground it is marked by a continuous line of white limestone that is accompanied by a wide pedestrian promenade lined by an avenue of distinctive palms (Roystonia regia).” (Download their PDF for more). What’s interesting here is the idea of building a new coastline, internal to the city. Framing that as a walk, an urban unit, and then leading people along this imagined shore. A new outside, inside. BLDGBLOG Presents: The Paleo-Coastal Walkway, a new guide to the lost seas of Manhattan. [Image: Bernard Khoury, Checkpoints, 1994]. In any case, Lebanese architect Bernard Khoury seems to view war as architecture pursued by other means. (Or perhaps vice versa). [Image: Bernard Khoury, B018, 1998]. Checkpoints, bunkers, new walkways, moving coastlines, oblique forms of entry – architectural responses to urban warfare could take up a whole website of their own. It’s a theme I’ll return to. For a bit more reading, meanwhile, check out this paper on war and anxiety, from the excellent Cabinet Magazine.